Southern-Fried Gameroom Expo is pleased to offer a commemorative t-shirt for our#SFGE2017 event! Acclaimed graphic artist and t-shirt designer David Kopet (DJKopet) created a custom design just for our show. Grab your limited edition t-shirt today and wear it with pride to our show this June! We will be selling these at the show, but you can order now! They will arrive to be shipped in just a couple of weeks. Be sure to choose which color style you prefer. 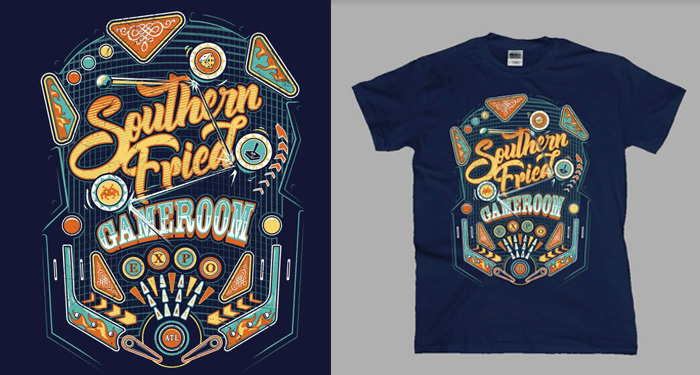 If you want to order multiple shirts email us at info@southernfriedgameroomexpo.com for assistance. Shirts are $20 each and shipping is $6. Sorry, no international orders. SORRY ONLINE ORDERS ARE NOW CLOSED. Get them while they last ONLY at #SFGE2017.